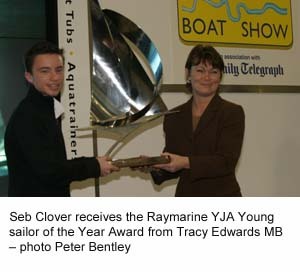 At a special awards ceremony on the main stage on the opening day of the London Boatshow at ExCel yesterday Curtis and Clover received their prizes from former winner of the award, Tracy Edwards MBE. Racing with Norwegian Bjorn Gjelsten aboard Curtis won the championship in October 2003 with victory in the Qatar Grand Prix – their 5th win in six races this year. Curtis and Gjelsten are also European and Pole Position champions.